Alexander Albon ran wide at the final corner during third practice for the Chinese Grand Prix, slamming into the wall and wrecking his Toro Rosso Formula 1 car. The black-and-gold livery Lotus used in the 1970s and 80s is one of the most iconic in Formula 1 history - so much so that teams continue to carry similar designs till date. Motorsport.com's selection of photos from the second and final Formula 1 pre-season test in Barcelona. Our team of photographers captured the 2019 Formula 1 cars from all angles during the first pre-season test at Barcelona. What are the most successful Formula 1 World Championship cars of all time? Find out in our stats-packed photo gallery. An error-strewn campaign from Sebastian Vettel and Ferrari went someway in Lewis Hamilton and Mercedes clinching the 2018 Formula 1 titles - and with several races to spare. Key statistics and figures from the Abu Dhabi Grand Prix, the final round of the 2018 Formula 1 season. Motorsport.com's selection of Formula 1 photos from FP3 and qualifying of the Abu Dhabi Grand Prix. All key statistics from the Brazilian Grand Prix, won by Mercedes Formula 1 driver Lewis Hamilton. Motorsport.com's selection of Formula 1 photos from FP3 and qualifying of Brazilian Grand Prix. Motorsport.com's selection of Formula 1 photos from Friday practice of Brazilian Grand Prix. All important statistics and figures from the Mexican Grand Prix, where Lewis Hamilton picked up his fifth Formula 1 title. Motorsport.com's selection of Formula 1 photos from the Mexican Grand Prix, where Lewis Hamilton clinched his fifth world championship. Motorsport.com's selection of Formula 1 photos from Saturday practice and qualifying of Mexican Grand Prix. Motorsport.com's selection of Formula 1 photos from Friday practice of Mexican Grand Prix. All key statistics from the United States Grand Prix, where Ferrari driver Kimi Raikkonen scored his first Formula 1 win since 2013. Motorsport.com's selection of Formula 1 photos from the United States Grand Prix, won by Kimi Raikkonen. All important statistics and figures from the Japanese Grand Prix, won by Mercedes Formula 1 driver Lewis Hamilton. Motorsport.com's selection of Formula 1 photos from the Japanese Grand Prix, won by Mercedes driver Lewis Hamilton. All the important statics and figures from the Russian Grand Prix, won by Mercedes driver Lewis Hamilton. Motorsport.com's selection of Formula 1 photos from the Russian Grand Prix, won by Lewis Hamilton. 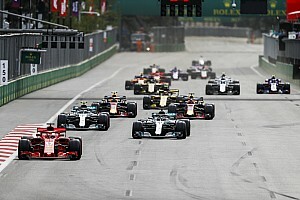 Motorsport.com's selection of Formula 1 photos from FP3 and qualifying of Russian Grand Prix.